As a Montessori parent, you may be looking for new and creative ways to incorporate the Montessori philosophy into your family lifestyle at home. One of the ways you can do this is by developing an appreciation for different cultures by celebrating world holidays. Culture is a major topic of study in the Montessori curriculum and by celebrating world holidays, you can easily teach children about the various traditions and rituals that people celebrate around the world. Here are just a few of the holidays that you can adopt at home to teach your children about the beauty and value of other cultures. Also known as the Hindu Festival of Lights, Diwali is a five-day festival celebrated by people in Fiji, Guyana, India, Jamaica, Malaysia, Mauritius, Myanmar, Nepal, Singapore, Sri Lanka, Suriname, and Trinidad and Tobago. Representing the renewal of life, Diwali is a holiday filled with many rituals that honor this tradition – such as lighting diyas (lamps), cleaning homes, opening windows, and wearing new clothes. As one of the most prominent and celebrated festivals in the world, the Chinese New Year is celebrated at the turn of the traditional lunisolar Chinese calendar. Each year is characterized by a different symbol in the Chinese Zodiac, such as the Year of the Tiger or the Year of the Dog. The Chinese New Year is often celebrated with many different traditions such as cleaning, having dinner with family, repaying debts, playing games, and consuming special foods. It is also customary for children to receive red envelopes filled with money in honor of the Chinese New Year. Also known as the Festival of Lights or the Feast of Dedication, Hanukkah is a Jewish holiday that is observed for eight nights and days. Hanukah is celebrated by lighting a candelabrum each night called a menorah, eating fried foods such as potato latke (pancakes), playing a game with a dreidel (a four-sided spinning top), and giving gifts. At Montessori Academy at Sharon Springs, we have found many ways to integrate culture within our practices of the Montessori philosophy. Along with celebrating numerous world holidays, such as the Chinese New Year, MASS students also participate in the Model United Nations conference – a forum that provides students with the opportunity to learn about other countries and hone in on their diplomacy skills. 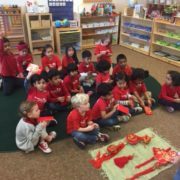 Montessori Academy at Sharon Springs also offers a new international, multi-language extension program called the Global Language Academy at Sharon Springs (“GLASS”). The GLASS program provides young minds with the opportunity to learn a second language and understand different cultures while growing in the era of globalization. Courses in Mandarin, Spanish, Hindi, Farsi, German, French and ESL (English as a second language) are all offered under the GLASS program. Last but certainly not least, we have the MASS International Festival. This yearly event offers a day in which we not only have fun, but also learn and experience many of the cultures found within our amazing community, and beyond. The event unfolds with a flag raising ceremony followed by the parade of countries. Then, children receive passports – becoming world travelers as they tour different countries while they visit each classroom community. Each country (classroom) offers the child a unique experience with the opportunity to engage in crafts, music, food, or other activities.